The identity of the villain of Star Trek Into Darkness has been one of the best kept secrets in Hollywood. Even in the Age of Spoilers J.J. Abrams has been able to tease information about his upcoming sequel completely on his own terms. First, there was the news that Benedict Cumberbatch had been hired as the baddie, prompting speculation that he would be playing Khan, despite bearing absolutely no physical resemblance to either a Sikh warlord or Ricardo Montalban. Second, Paramount released the released the official synopsis, which indicated that the villain would be a “one man weapon of mass destruction” from within Starfleet. That began speculation that he’s Gary Mitchell, Kirk’s friend turned godlike nemesis in the original series classic “Where No Man Has Gone Before.” Finally, we got a 60-second teaser with Cumberbatch’s villain making a towering, superhuman leap. His brown hoodie seemed Beyond Thunderdome cheesy enough to mean that he’s Khan or one of Khan’s followers, but those leaping skills seemed more in line with Mitchell’s deity-caliber powers. So that’s it, folks! Cumberbatch’s villain is named John Harrison, a completely new character with no previous roots in Trek canon. Unless you want to believe that the studio is really messing with us and “John Harrison” is just some sleight of hand to lead us away from the Cumberbatch character’s real identity. There are not many Harrisons in the Star Trek legendarium, though one, simply named “Harrison,” played by veteran extra Ron Veto, appeared in six episodes of the original series, including Khan’s classic introduction, “Space Seed,” where he was among the bridge crew who suffered oxygen deprivation. Oddly enough, in that episode Kirk noted in his log “Although Harrison was on the bridge, he was the only of the visually accounted for that didn’t end up in the briefing room after being incapacitated.” Curious. This leaves us with so many questions. 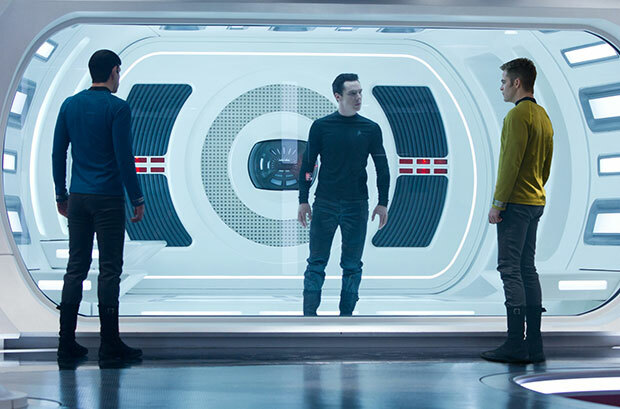 Could John Harrison really just be an envoy for Khan, waiting somewhere in the galactic wings? Is Abrams pulling a Nero and simply inventing a new character while perhaps indirectly drawing an aspects of Trek canon (like Gary Mitchell) as he did with his 2009 film? Beyond Khan, are there any Trek villains instantly identifiable enough that they just have to be reused for a sequel film? Or is Paramount, in their Q-like omnipotence, just messing with us after all? And why does every villain these days have to be trapped in a glass prison?